Samsung may finally launch a phone with an in-display fingerprint sensor next year. The Galaxy S10 is expected to be the first Samsung flagship to get the feature. Samsung already has various patents on in-display fingerprint technology for smartphones. The company aims to expand this technology to smartwatches as well. Samsung filed for this patent with the USPTO in Q2 2018. The new Samsung patent illustrates a Galaxy device with a fingerprint sensor disposed on the rear surface of the display. The sensor is capable of detecting a touch having a specified pressure which the company refers as “force touch”. Samsung notes that the sensor will detect the force touch only through a specified area, in this case, the lower portion of the display. The fingerprint recognition area will be located within this force touch area. 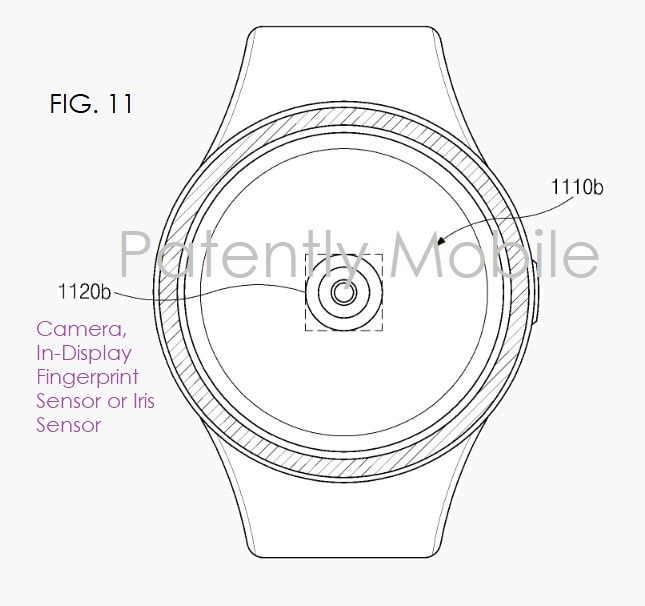 The patent document hints that Samsung may use this technology in both smartphones and smartwatches. Samsung has also specifically stated that the device using this technology may include a display panel, a touch sensor, and/or an electronic pen sensor. The electronic pen sensor will be capable of receiving a touch, a gesture, or a hovering input from an electronic pen. The display panel may include an LCD, an LED, an OLED, a MEMS, or an electronic paper display panel. The touch sensor, meanwhile, may include a capacitive, a pressure-sensitive, a resistive, an infrared, or an ultrasonic touch panel. These patents are, of course, never a confirmation that the company is actually working on a device to use it. However, it’s interesting that Samsung is at least mulling with the idea of using it on a smartwatch. Imagine a Galaxy Watch with an ultrasonic in-display fingerprint scanner! I can’t see the benefit of this. The watch is on your wrist anyway. Plus you’re putting a smudge on the watchface every time you use it. I hate smudges which is why I have a Galaxy Tizen watch with bezel navigation rather than Wear OS. A fingerprint sensor would be ok on one of the buttons. The screen? No chance, unless they’ve come up with a smudge free glass too. And once again, Samsung will be the second to actually start making such a watch, after a Chinese company, just like they always are. But that’s playing it safe due to the Note 7 disaster, so I respect their strategy about this. The Note7?? We’re coming up to Note10 next year! It has absolutely no relevance to this anyway. Catch up with the times man! Lolol! Yeah that Chinese company gets points for being first with a foldable phone. But who is going to put down 1200 or so for that monstrosity. First is nice for bragging rights, but what use will it be when only a handful will remember the product. There is making it first, and making it best. Now, if you’re telling me that this chinese foldable monstrocity means something, then ok, I respect your opinion, however I do prefer making it best. A good question.. Not sure what that’s supposed to be. Digitizer, like there is in the Note … WACOM chip … (mag field sensor basically).